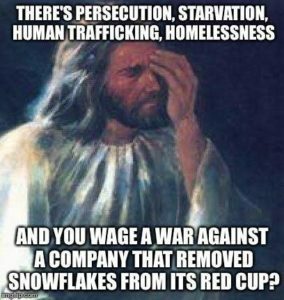 Would Jesus Drink Coffee from a Red Cup? November 11, 2015 — Merry Christmas, everyone. For nearly a decade, I worked as a sales representative calling on physicians in three surrounding states. The company offered ongoing specialty training about the diverse religious traditions of those we served. It wasn’t unusual to meet a Methodist or a Mormon, a Hindu or a Muslim, a secular or religious Jew, or Seventh Day Adventist. I appreciated this heads up, written reminders that Ramadan was ahead or information on what Kwanzaa means. The company also made sure we understood the differences among certain sects, a Shia or a Sunni, for example. We learned the Hanukkah doesn’t equate with the Christian holiday of Christmas. Learning about these faith traditions was a wonderful opportunity for me, and opened my eyes to a wider world outside of my high Protestant background. I was raised in a Christian home, and am a Christian. I celebrate the historical and spiritual birth of Jesus on December 25. Something has gone terribly wrong. There used to be a popular song called “I Just Go Nuts at Christmas” and this year I think it applies big time. Never mind that it’s fair game for stores to put out over-the-top Christmas displays right after Labor Day, never mind that satellite radio offers multiple channels of Christmas music (though I’m not sure a carol could be found), never mind that gift-giving and Black Friday overtake any spiritual meaning of the holiday. If all of that wasn’t enough to make one a Grinch or a Scrooge, now we have the red cup controversy. Apparently it began as a joke. Some sarcastic right of center person thought it funny to egg his friends on his Facebook page. He posted something about the war on Christmas and then demanded that Starbucks write his name down as “Merry Christmas.” I am not sure that anyone with any sense took this seriously but soon it was everywhere. If there is a war on Christmas, I’ve missed it because in my area Christmas is a holiday that runs from the end of summer until about February 1. And then we have a fake uproar over a red coffee cup. I love Starbucks. I have a cup of coffee every morning, and when I remember it is in my re-usable cup. My coffee is generally handed to me via the drive-up about 7:45 a.m. by a lovely young woman in a hi-jab. I appreciate the fact that a business in the heart of middle America didn’t bat an eye about putting a young Muslim woman at the drive up in an area where there are probably not more than 100 Muslim families. So I’m a Starbucks fan. I give Starbucks cards as gifts. I have meetings in Starbucks. It’s a part of my life. My choice. Sorry if that offends you, but my town doesn’t have Dunkin’ Donuts. And while the local yokels across the street serve good products, they don’t provide employee health insurance. I like the product; I like their politics. I go there, so sue me. But what an ignorant, ignorant thing this red cup business is. Has this sarcastic right of center person (I refuse to put his name on my page) BEEN to a Starbucks lately? I took the picture at the top of the story this afternoon when I met a customer for a late meeting. 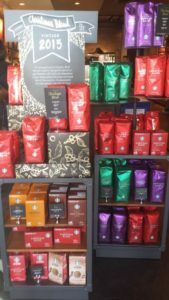 I walked in the door and could barely get around the large display of Christmas items, including a blockade of Christmas blend coffees. That’s truly what Jesus would have wanted. Let’s see, five loaves? Two fishes? And grande pumpkin spice lattes for everyone on the mountainside! The store was packed with Christmas related inventory. Did I mention the over sized Advent calendars made entirely of Christmas bulbs? And the rows upon rows of white Starbucks cups with a J and an Y astride the Starbucks logo, spelling “joy.” Joy? Hmmm. What is that? Some kind of secular word describing demons and hell? The holiday that represents the birth of the Prince of Peace has been bastardized to honor the gods of overspending and avarice and greed and mega-consumption. Remember how lovely it was when the Big Box store delivered the curved Samsung LCD TV to Joseph and Mary in the manager? The Baby Jesus was so happy to watch his toons in High Def. That is truly the meaning of Christmas. 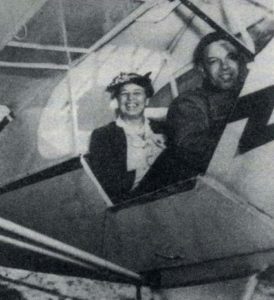 If there is a war on Christmas, then I’m Eleanor Roosevelt and I can fly. Jump back a step and enjoy your coffee, no matter your faith tradition. Above I posted a picture from a Temple in Georgia, and they get it right. 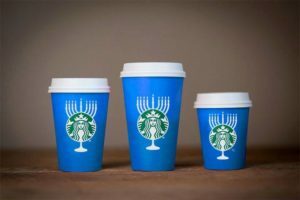 Maybe Starbucks can honor all religious traditions. Or maybe they can just sell coffee. Jesus is laughing at us, but he might be crying as well. He realizes that we are missing the point on most things. Coffee is one of our gifts and we’re making asses of ourselves when we have so much more important work to do. Do you think the Syrian refugees care about the color of coffee? Oh, wait, they have no water. My friend Jeanne Burger posted this meme on Facebook and it truly says it all, so I’ll end with it and thank her here for sharing the truth. Wouldn’t it be wonderful if the birth of the Prince of Peace was truly a holiday about peace, and following the example of Jesus. Didn’t he say the greatest commandment of all is “Love one another.” I did not always pay attention in catechism, I’m not sure I can tell you Luther’s second article verbatim, but I got the part about love one another. Mental Illness and Addiction: Truly Bi-partisan Issues Do you love someone who has dementia?